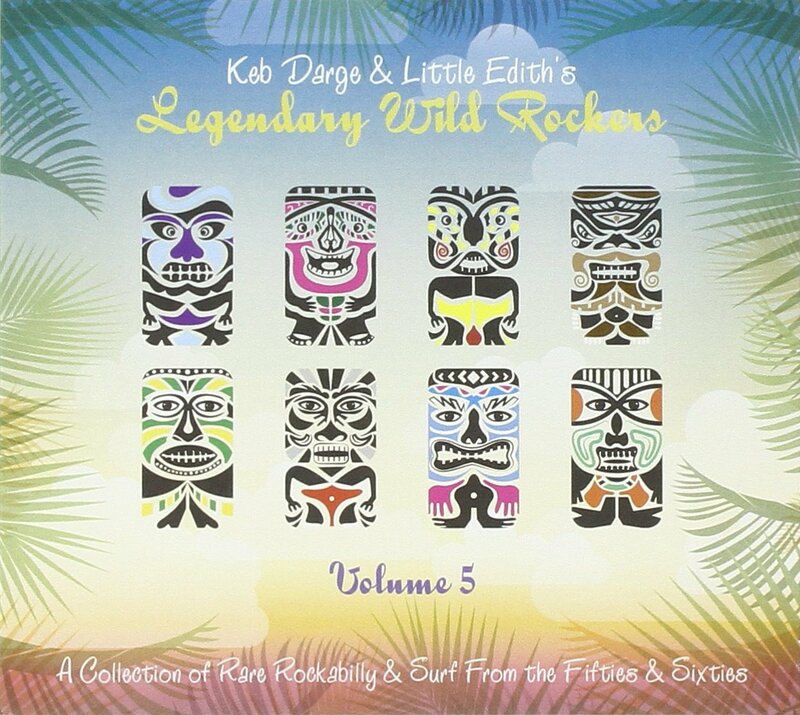 KEB DARGE AND LITTLE EDITH’S LEGENDARY WILD ROCKERS VOLUME 5. This was after Keb’s divorce. Like many people, a divorce proved devastating for Keb. He was forced to sell his beloved record collection. For a working DJ, this was a disaster. Without records, a DJ-ing career wasn’t feasible. Heading out into civvy street, Keb tried various jobs to make ends meet. Then, when he rediscovered some records in his loft, this would change his career, and life. One night, Keb discovered a pile of records in his loft. When he looked through them, he realised that this was “only” his “junk records.” Or so he thought. Little did Keb realise that his “junk records” would give birth to two musical phenomena. The first was “deep funk,” which Keb is the founding father of. However, Keb’s “junk records” would also feature on the early volumes of the Legendary Wild Rockers’ series. Keb’s “junk records” player their part in the success of Keb Darge and Little Edith’s Legendary Wild Rockers. Back then, this was just the first instalment in the Legendary Wild Rockers’ series. Neither Keb, nor Little Edith realised that the Legendary Wild Rockers would become an annual occurrence. Just over a year later, Keb Darge and Little Edith’s Legendary Wild Rockers 2 followed in July 2012. It featured R&B, rockabilly and surf. This eclectic selection of music caught the attention of music lovers. Keb and Little Edith were on a roll. It was almost inevitable that there would be a third instalment in the Legendary Wild Rockers’ series. That came as no surprise. The Legendary Wild Rockers’ series had become one of BBE Music’s most popular series. Eleven months later, and Keb Darge and Little Edith’s Legendary Wild Rockers 3 was released to widespread critical acclaim. Somehow each instalment in the series seemed to surpass the previous instalments. Keb’s “junk records” were quickly becoming a musical phenomenon. However, this musical phenomenon nearly was no more. In 2013, the village in the Philippines where Keb Darge and Little Edith livex was destroyed by a typhoon. Nothing was heard of Keb Darge and Little Edith for several days. Some people feared the worst. Eventually, came the news, Keb Darge and Little Edith were safe. They’d survived one of the most devastating typhoons to hit the Philippines. It had been a harrowing period for Keb Darge and Little Edith. Despite this, they were determined to compile Keb Darge and Little Edith’s Legendary Wild Rockers 4. Somehow, Keb and Little Edith managed to cheat death. Their house was in ruins and much of their possession destroyed. So, Keb and Little Edith had to escape from the devastation left behind by the typhoon. They decided to return to London, clutching a pile of records. Among the records that Keb and Little Edith brought back to London, were the twenty tracks that made their way onto Keb Darge and Little Edith’s Legendary Wild Rockers 4. They were recorded between 1956 and 1964. These tracks were recorded by some of the music’s pioneers. This was perfect for Keb and Little Edith’s comeback compilation. Despite the trauma that Keb and Little Edith had experienced, they had managed to compile what was regarded as the finest compilation in the Legendary Wild Rockers’ series. Critics, cultural commentators and music lovers were one over by Keb Darge and Little Edith’s Legendary Wild Rockers 4. After four volumes, there was still live in the Legendary Wild Rockers’ series. Did this mean there would be a Volume 5? Of course there would be. Summer wouldn’t be summer without the latest instalment of the Legendary Wild Rockers’ series. So, on 11th May 2015, Keb Darge and Little Edith’s Legendary Wild Rockers Volume 5 was released on BBE Music. Keb Darge and Little Edith’s Legendary Wild Rockers Volume 5 features a total of twenty-one tracks. The music is described as “more raw, rootsy rockabilly and surf sounds.” There’s contributions from Ahab and The Wailers, The Thunderbolts, Bobby Verne, Wally Hughes, The Dynamics, Bobby De Soto, The Jesters, Brownie Johnson and Elroy Dietzel. Together on Little Edith’s Legendary Wild Rockers Volume 5, which I’ll pick the highlights of. This comes courtesy of Ahab and The Wailers. 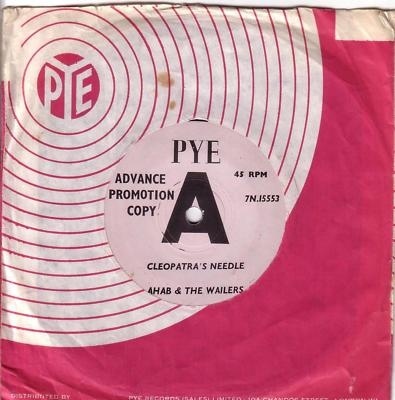 They released Cleopatra’s Needle, in Britain, on Pye Records, in 1963. This proved to be their one and only single. On the flip side was Neb’s Tune. It’s best described as cinematic surf, with a proto psychedelic sound. Neb’s Tune wouldn’t sound out of place on the soundtrack to the latest Tarrantino movie. If the rest of Keb Darge and Little Edith’s Legendary Wild Rockers Volume 5 is as good as Neb’s Tune, it’s going to be an explosive journey. Originally, Ron Haydock and The Boppers released Baby Say Bye Bye on Cha Cha Records, in 1960. This was a year after they released their debut single 99 Chicks. Neither 99 Chicks, nor Baby Say Bye Bye proved particularly successful. However, both tracks are well regarded, and were later reissued. Keb Darge and Little Edith eschew the predictable however. Instead, they flip Baby Say Bye Bye over, and choose to cover Maybelline. While it’s an oft-covered track, Ron Haydock and The Boppers deliver a blistering and joyous version of this classic track. 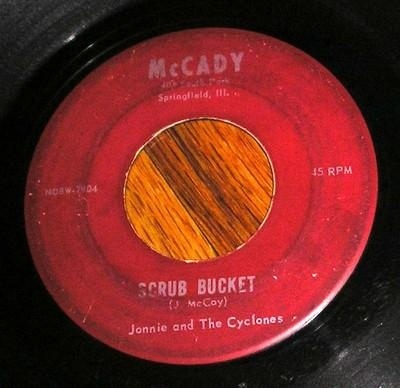 In 1959, Jonnie and The Cyclones decided to release Scrub Bucket as a single. Rather than sign to a record label, they founded their own label McCady Records. Its first release was Scrub Bucket. On the B-Side, was Twisted Fender, a slice of surf rock. It’s become a favourite within the surf community, and found its way onto the Surf-Age Nuggets: Trash and Twang Instrumentals. No wonder. It’s an irresistible instrumental. The Dynamics were a Louisville group, who provide another surf rock instrumental, Later On. It was recorded at Farrell Records, on Portland Road, Louisville. With its twanging guitars and blazing saxophone, it’s a real find and must be one of the highlights of Keb Darge and Little Edith’s Legendary Wild Rockers Volume 5. Duke Dickson and The Teens are another group that only released one single. Mind you, what a single it was. Is You Is Or Is You Ain’t was released in 1959, on Bakersfield based, Global Records. Sadly, Global Records only released one further single, Joe Hall’s Bongo Beating Beatnik. The labels finest moment was undoubtably, the rock ’n’ roll of Duke Dickson and The Teens’ Is You Is Or Is You Ain’t. Most people associate Folsom Prison Blues with Johnny Cash. It’s one of his classic songs. However, other people have covered Folsom Prison Blues. This includes Billy Tidwell and The Chivells. It was the B-Side to their 1965 single, I Was Standing Too Close To A Heartache. It was released on the Ko Co Bo label in 1965, and nowadays, is a real rarity. There’s a reason for this. The record company picked the wrong song for the single. 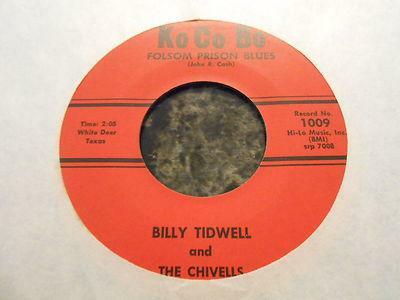 Billy Tidwell and The Chivells’ cover of Folsom Prison Blues far surpasses the quality of I Was Standing Too Close To A Heartache. So when it was released, the single flopped. Since then, copies of the single have become increasingly rare. Collectors that have a copy, are holding onto them. Nowadays, the only way to get hold of a copy of this hidden gem, is by buying a copy of a compilation like Keb Darge and Little Edith’s Legendary Wild Rockers Volume 5. 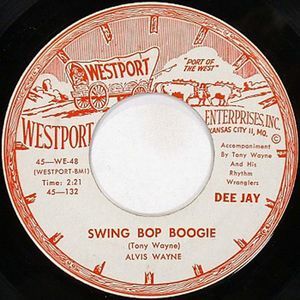 If you’re a fan of rockabilly, then Alvis Wayne’s Swing Bop Boogie will be right up your street. This was Alvis’ debut single. It was penned by Tony Wayne, and released on the Westport label, in 1956. Swing Bop Boogie features a vampish vocal from Alvis, who pays homage to Elvis on this poppy slice of rockabilly. The rockabilly keeps on coming. 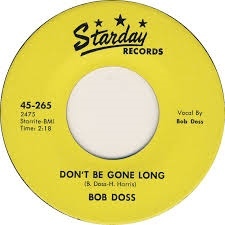 Bob Doss contributes Don’t Be Gone Long. It was released on Starday Records, and features none other than Hal Harris on guitar. His guitar is at the heart of the track. So is Bob’s Elvis’ inspired vocal. They play their part in what’s considered to be a rockabilly classic that was later reissued by Starday Records in 1972. Royce Porter is responsible for what’s one of my favourite rockabilly tracks on Keb Darge and Little Edith’s Legendary Wild Rockers Volume 5. That’s Yes I Do. It was written by Roy Doggett and released on Look Records. With its jangling guitar, sweeping harmonies and a vocal that sounds as if it has been inspired by The King, Yes I Do is still guaranteed to fill a dance-floor. The Jesters close Keb Darge and Little Edith’s Legendary Wild Rockers Volume 5 with their own brand of musical magic. Panther Pounce is their second contribution. The first was Side Tract, one of the rarest tracks on Keb Darge and Little Edith’s Legendary Wild Rockers Volume 5. The last copy of this surf rock track I could find, sold for $257. That was over a year ago. For that price, you could buy every volume in the Legendary Wild Rockers’ series. As for Panther Pounce, copies are almost impossible to track down. Apparently, this is a take on Strange Man, which Jim Messina and The Jesters recorded. Of the two versions, my favourite is definitely the uber rare and urgent Panther Pounce. Just ten months after Keb Darge and Little Edith released their comeback compilation, Keb Darge and Little Edith’s Legendary Wild Rockers 4, they make a very welcome return with Keb Darge and Little Edith’s Legendary Wild Rockers Volume 5. It was released by BBE Music on 11th May 2015. Featuring twenty-one slices of rare rockabilly and surf rock, it’s the perfect soundtrack to the summer. That’s not all. Somehow, Keb Darge and Little Edith’s Legendary Wild Rockers Volume 5 have managed to do what looked almost impossible, and surpassed the quality of the previous volumes in the series. That took some doing. Volume 4 was crammed full of quality cuts. However, Keb Darge and Little Edith pulled out all the stops for Keb Darge and Little Edith’s Legendary Wild Rockers Volume 5. Starting with Ahab and The Wailers, Ron Haydock and The Boppers, Jonnie and The Cyclones, The Dynamics, Duke Dickson and The Teens, Alvis Wayne, Royce Porter and finishing with The Jesters’ unique brand of musical magic. In between, The Thunderbolts, Bobby Verne, Bobby De Soto, Brownie Johnson and Elroy Dietzel play their part in the sound and success of Keb Darge and Little Edith’s Legendary Wild Rockers Volume 5, which is without doubt, the best instalment in the series. ← I HAVE A TRIBE-YELLOW RAINCOATS E.P.